North-east lifeboats raced to rescue an abandoned boat on Saturday evening. The Fraserburgh and Macduff rescue teams were alerted to the vessel at around 7pm after a kayaker reported sighting an upturned vessel a quarter mile east of Crovie Point. The abandoned boat was almost fully submerged and hidden from sight in an inaccessible cove at the bottom of a high rocky cliff. Expecting the worse, RNLI Lifeboat the ‘Willie and May Gall’ sped from Fraserburgh Harbour and headed west towards the boat. Coxswain Vic Sutherland, mechanic Dave Buchan and volunteers Stephen Brown, Graeme Duthie, William McDonald, John May and Nathan Whyte were part of the rescue team. It wasn’t until they were at the scene that they became aware the vessel had in fact been abandoned the day before and no one was inside. Working together, Fraserburgh and Macduff Lifeboat crews towed it to Gamrie Harbour at Gardenstown. The lifeboats were then able to return to their respective stations. A coastguard staff member came across the vessel’s owner in Gamrie and search parties were stood down. 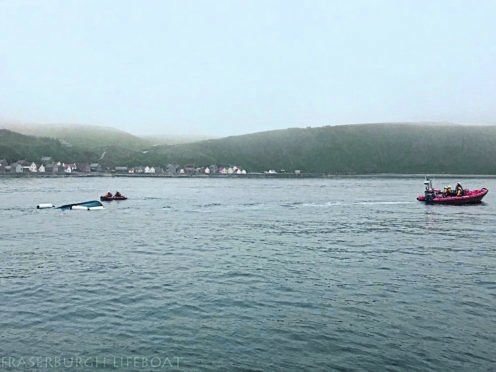 It later emerged that the occupant had alerted a nearby yawl sailing boat when his own vessel started sinking on Friday afternoon. He was taken aboard the yawl and returned home without informing the coastguard about his abandoned boat. A number of locals had reportedly been aware of the incident, but assumed the coastguard had been alerted to the situation.